Victoria Sandbrook is a fantasy writer, nonfiction editor, and hiker. As the senior editor at Appalachian Mountain Club Books, Victoria works closely with authors writing instructional content on hiking, paddling, and other means of outdoor travel. She has also been certified in Wilderness First Aid, has received training in outdoor leadership, and has logged a few hundred miles on-foot in the White Mountains of New Hampshire. Of course, any opinions or instructions are her own. Her novel in progress, to no one’s surprise, is set above treeline. She keeps the world apprised of her progress on Twitter and her website, victoriasandbrook.com. From Dorothy’s journey through Oz to the Walk to Mordor, on-foot journeys are a staple of fantasy fiction. Wide-eyed young heroes tread jauntily between adventures with rucksacks and minimal provisions. Bands of travelers opt to take shortcuts through treacherous mountain passes. Distance, day length, and weather often seem to have little bearing on anyone’s rate of progress. In reality, the difficulty of the terrain, the availability of food and water, the weight and design of a pack, and unpredictable forces of nature all impact the stamina and well-being of travelers on foot. But you don’t have to assume every character will be a Cheryl Strayed or a Bill Bryson, bumbling through your fantastic wilderness with the know-how of a mundane city-slicker. If you want your characters’ journey to ring true, consider how these variables can play into your worldbuilding and plot. In reality, one does not simply walk into Mordor: you have to plan the trip first. In the real world, the Yosemite Decimal System (YDS) categorizes terrain into six classes, from walkable to requiring equipment for more than just safety. Each class has its own concerns, but the first three are generally hiking-related, covering everything from a sidewalk to mountainous, hand-over-foot scrambles. Classes 4, 5, and 6 cover increasingly technical rock climbing, which (in the real-world) is most often tackled for recreation and not travel. Besides the type of path, you also have to consider grade, altitude, and season. On flat Class 1 terrain (think the Yellow-Brick Road), an average human walking pace is around 4 mph (a 15-minute mile). On steep Class 3 terrain gaining a 1,000 to 2,000 feet of elevation per mile (arguably entering Misty Mountain territory), an experienced and fit hiker can hit a 2 to 3 mph pace in good conditions. Your characters’ level of fitness and familiarity with the terrain will definitely affect how long this pace can be maintained. Other surfaces—sand, ice, snow, gravel—will all affect speed and stamina as well. For someone used to living at sea-level, altitude sickness can set-in at 8,000 feet elevation. Supplemental oxygen is needed above 12,500 feet. 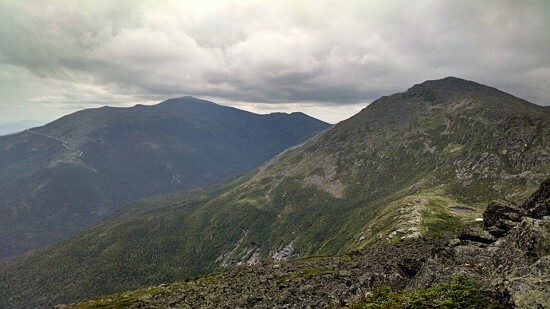 Remember, though, that rough terrain can be found below these limits: Mount Washington is only 6,289 feet versus Mount Everest’s 29,029 feet, and the former’s grueling paths are often used to train for the latter. Finally, winter weather can drastically change terrain. Some rough paths become smooth sailing for snowshoers and cross-country skiers. Others become treacherous ice chutes or avalanche-prone fields. Crossing a large backyard in hip-deep snow can feel like you’ve hiked a mile (ahem, Tolkien…again). Unless your characters are well provisioned and acclimated, setting the journey in winter is a great way to put them in immediate jeopardy. Got lembas? Great! Near a clean water source at all times? Perfect! Your characters are all set for staying well fed and hydrated over their journey. Even in the real world, it’s not unrealistic to find a path where food and water are readily available at a village or through hunting and foraging. But even in lands of plenty, your characters may not be able to find everything they need every day, and it’s likely they’ll carry some provisions. How much your characters carry may depend on how much they need. Long-distance hikers in temperate weather burn 3,000 to 5,000 calories every day; in winter, human bodies burn calories even faster (approx. 1,000 calories for every hour spent gaining 1,000 feet in elevation). Calorie-dense foods are a traveler’s best friend. Assuming that lembas has the caloric density of Fritos (160 calories/ounce), your human characters would only need 20 to 30 ounces per day. A steady diet of beef jerky would require twice that amount; it isn’t much weight wise, but it wouldn’t take long to feel pretty awful. On the other hand, you’d need to eat about 17 pounds of apples to meet the same caloric need. Not only is that rather outrageous if your character is carrying a few days’ worth, but that’s a lot of apple. Still, some characters (your scarecrows and tin woodsmen, for example) may not need to eat at all. Water needs will vary based on exertion, environment, weight, and more. You can use a calculator like this one by CamelBak for an exact volume. When it comes to writing, though, access may be more important. If your characters aren’t drinking frequently from a source, water gets heavy: every liter weighs 2.2 pounds. And if they’re not filtering or boiling water before they drink it, they’ll likely catch something. Giardia is in almost every body of fresh water on Earth, no matter how seemingly pristine. All this talk of weight leads right into the next area of concern. Is your expedition equipped with Bags of Holding™®? If not, there is likely a limit to what your characters can carry both due to the packs’ designs and the weight carried. There’s a good reason modern hiking packs are built as they are. The belt is key: a well-fit pack puts most of the weight on the hips and the shoulder straps are primarily for load balance. This saves the back a lot of strain. External frame packs are inherently heavier and less stable, but allow weight to be more effectively placed on the hips and keep the traveler walking upright. Internal packs give hikers a better center of balance, trading a bit of comfort and good posture for a more streamlined profile. I shudder to think of how uncomfortable Dorothy’s picnic basket would have been after a few hours, much less days on the road. This is where pack weight becomes important. If your characters are carrying old-style rucksacks, there’s going to be a lot of weight-shifting, back strain, and fatigue. Even if your characters are using well-designed packs, it only takes 20 pounds or so to throw someone off their game if they haven’t been training while carrying weight. If you’re sending characters into an unexpected journey, it will take them some time to get used to lugging their packs around, even if the weight carried is reasonable. So how much is reasonable? 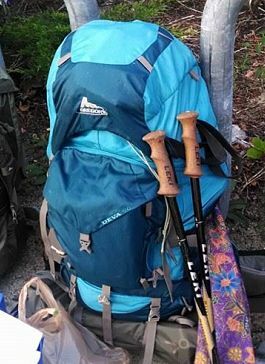 For safety, a pack should not weigh more than 33 percent of a hiker’s bodyweight; ultralight packs can be lower than 20 percent depending on season and needs. But some take the concept of “ultralight” to an extreme known as “stupid light” and choose to leave basic safety gear at home. HikeSafe provides a list of gear recommended for the responsible hiker in New England; other climates would require different considerations, but it’s a good start. Know what you want your travelers to have when the going gets rough and how they’ll manage if they don’t have what they need. So what does your world demand of your characters? What issues are solved by your tech or magic, and where are your characters more at-risk? And where do you want fact to end and fiction to begin? If you start with an analogous real-world terrain, turn to local hiking clubs and guidebooks to get an idea of the skills required and the standard travel times anticipated. If you’re setting your journey in a less modern world, read first-ascent stories in the archives of old climbing journals like Appalachia. Go to your local outdoor store and read up on old-fashioned gear to back-engineer devices to which your characters may have access. 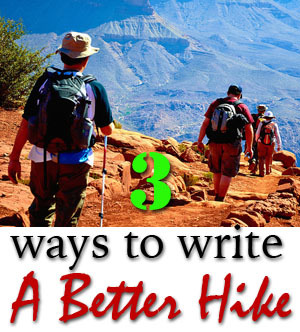 Plus, there are loads of great blogs dedicated to every aspect of hiking, climbing, and survival. Other relevant posts in this series include wilderness survival by wildlife biologist Rebecca Mowry and what the woods are really like by our generous host Dan Koboldt. So just how real should your journey feel? Well it’s up to you. But depending on what you throw at your characters, whether fact or fiction, their mileage may vary. This is an invaluable article, answering so many questions – as well as proving that other people get bugged by the same things as me. If you know anybody who can write something similar involving travel by horse you will have saved me months of research! Can I then come back to you whenever I’m thinking of starting a new book, please? Great article! I have a character who walks/hikes quite a bit. Glad for the resources in here (though she does have a backpack of holding 🙂 ).